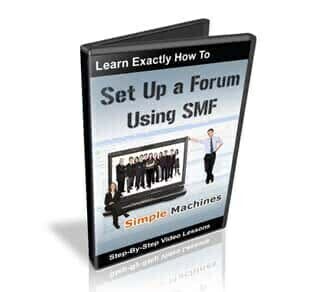 Find out how to set up a forum using smf. step-by-step video tutorials explain how to turn the simple machines forum into an automated paid membership site. Plus you get a valuable video lesson on how to turn SMF into a money making automated Paid membership site using free tools. Creating your own community site can be very rewarding – and even fun. When you have a strong interest in a topic or a good amount of knowledge you might want to consider setting up your on line community. There are lots of different typed of software out there that you can use – both free and paid. One of the easiest ways to do this is to set up a forum. Forums have been around since the Internet was first publicly available and many of them are hugely popular. The good thing about using a forum for your community is that it is drop dead easy to install and set up. Not only that, it comes loaded with everything you need to get your forum going right out of the box. No need to install extra functionality to get you going. Now that is not to say that you can’t install extra functionality by adding modules. (more on this later). Another good thing about forums is that they are so widely used on the Internet that almost everyone is familiar with how to use one and get around within the forum structure. As you can see using SMF for your community forum will be a very smart move. In the video series you will be taken step by step through the install process as well as the setup process for your SMF forum. Now let’s talk about how to make money from an SMF forum. In this video series I will show you how you can create private sections of your forum that only paid members can access. Not only that – I’ll show you how to integrate it with PayPal so that subscriptions are fully automated. You just set it up and watch the money roll in. This is all the information you need to get your community site and membership site up and running TODAY! It’s time for you to get your site up and running!